Angie Bellini was in a bind. Her mother had decided to get her a man for Christmas. It wasn't that Angie didn't want a man, but she could darn well get one for herself, without her mother's help. Unfortunately, word seemed to have spread, and every single man she encountered was asking for a dance at the upcoming wedding reception. Having to take over deliveries for his father who was recuperating, Wes O'Connor probably should have expected the icy welcome of Mrs. Bellini at Bellini Bakery. He may have matured, but apparently, she still held a grudge for a high school incident. The pleasant surprise was Angie. Not only was it entertaining to watch her dealing with all the requests to dance, but he simply enjoyed her. When she proposed that they pretend to be seeing each other in order to get some peace from her mother, Wes was more than willing. 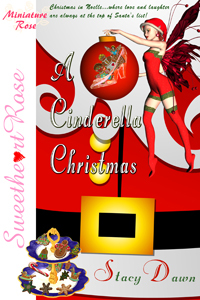 A Cinderella Christmas was the perfect fit for a fun, romantic holiday read. This story is set at the same time as Christmas on Parole, with both stories set days before Brent and Jess's (from Reindeer Games) wedding. Although a short story, it is packed full with entertaining characters and contains a well developed romance. I love Stacy Dawn's Christmas in Noelle series, and reading a new story in the series is becoming one of my favorite holiday traditions.